Happy St. Patty's Day!!! Now I have to be honest (I always am though... haha! ), I really don't care about this holiday. I know, I know, I am part Irish and that's a horrible thing to say so I'm sorry to my Irish Ancestors, but I really don't get the point of turning everything green, and since I've never seen a leprechaun (other than on my lucky charms box) I'm pretty sure it's just a silly holiday. I do however enjoy one particular Irish dish, Colcannon! Haven't heard of it? Not surprised... It's not the most famous Irish dish there is (Corn Beef and Cabbage = yuck in my book but that's just me!) but it is my family favorite and is what I grew up on for St. Patty's Day. Traditionally this can be made with either Cabbage or Leeks, and without Ham (though most recipes do add it these days). For a little bit of background info on Colcannon, it was not traditionally served for St. Patrick's Day. *In Ireland colcannon was associated traditionally with Hallowe'en (31 October) festivities, when it was used for the purposes of marriage divination. Charms hidden in bowls of colcannon were portents of a marriage proposal should unmarried girls be lucky enough to find them, whilst others filled their socks with spoonfuls of colcannon and hung them from the handle of the front door in the belief that the first man through the door would become their future husband. * Pretty interesting huh? Yeah I thought so too, now to be honest I did not hide any charms in my Colcannon tonight, ah the joys of being happily married! haha! Now I have to tell you the one thing that totally made me laugh out loud, when I was at the store the other day and bought the ingredients to make this wonderful dish, I got home and was perusing my receipt just to double check some things I realized I was charged for a head of lettuce... I did not buy any lettuce... I already have lettuce in my fridge... I start scratching my head... Suddenly I realized, she rang up the cabbage as lettuce!! HAHA!!! Oh I laughed so hard, it was to precious a mistake to upset me whatsoever, but it did make my day! For me this brings back so many memories, so I just love this meal. Now I am going to shock you with this fact.... This meal... 1 serving... 392 Calories!!! Yes, you read that right!!! It's comfort food, without the guilt! This is different, and not everyone may like this as I do. My hubby is on the fence about it, but hey he's eating it! 4 stars. This sounds great! I was that kid who always mixed my food together (and still do...even did at dinner tonight!). I just love different textures/temps in the same bite (warm food, like chicken with just out of the fridge cold cottage cheese = comfort food!). I'm looking forward to trying this out Kimmie! Love this. I made colcannon last year for the first time, and boy was it a hit! It's so funny that you posted this recipe. I planned on getting the stuff to make this for your dad tonight to surprise him. Colcannon is comfort food at its best. Yummy!!!!! Happy St. Patrick's Day, Kim! I'm so happy to find your blog. I love it. My Pop grew up on a farm, and my husband remembers his grandmother making Colcannon so you've brought back some nice memories for us today. Thank you! Ahhhaa. I had completely forgotten about colcannon. You are dead right: will just have to continue St Patrick's and make this over the weekend! Great post. 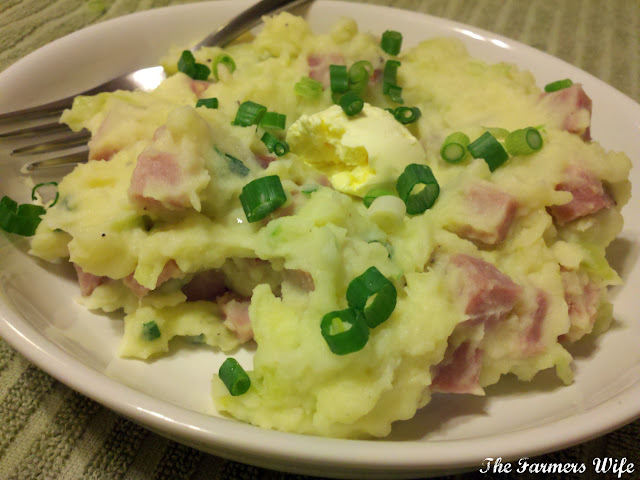 I've never made or eaten colcannon, but this sounds so good, and hearty, really. I chuckled about filling your socks with colannon, ha ha! I really like colcannon... I have had it maybe 3 times, and it was always a hit! Now I have my own recipe, thanks to you! Wow! Thank you so much Travis! I feel very honored that you chose my recipe! Happy St. Patty's Day!